Fill the glass with water, and then try floating the ball in the centre of the water, try and keep it there for more than 10 seconds. Now try filling the glass right to the top so it is just about to overflow, see if that is any easier. You should find that it is virtually impossible to float the ball at the centre to start with, there seems to be a force pulling it to the side. But if you overfill the glass the ball floats in the centre easily. Water has a property called surface tension, this means that the surface of water is always trying to shrink, and will pull on objects with a constant force for every mm of the edge to try and achive this shrinkage. 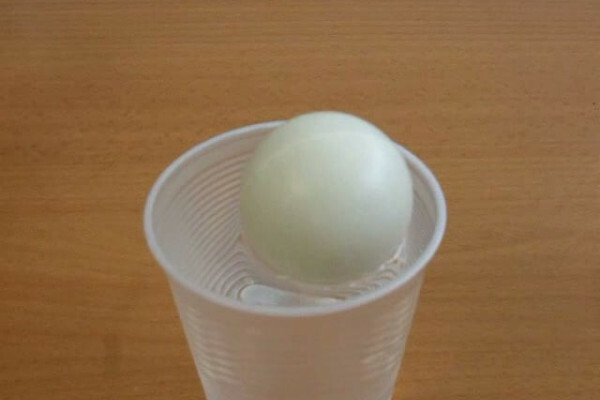 Both glass and ping pong balls are hydrophillic (water loving) so water is attracted to them and climbs up the sides slightly forming meniscuses. This means that the surface tension is acting diagonally downward on the ball. The water rises up the sides of the ball and the glass to form meniscuses because it is attracted to them. The surface tension of the water is always pulling at the edges of the ball, but in the centre it is balanced so the ball doesn't move. If the ball gets near the side though the two menicuses merge and the water gets flatter in between. So the surface tension on this side is acting almost horizontally, but on the other side the force is still acting diagonally down. Overall the force will therfore pull the ball to the side. When near the side the water is flatter than on the other side so the overall force is toward the side. In this case when the ball gets nearer the side the surface becomes almost vertical, so the overall horizontal force is away from the side. However if the glass is overfilled the meniscus is curving in the other direction which means that as the ball gets closer to the side the surface tension becomes more vertical, so the overall force is pulling the ball back into the centre. This is also the reason that if you sprinkle small objects (like breakfast cereal) on the surface of water (or milk) they tend to be attracted to both the sides and each other. The contact angle doesn't change as the ball moves.It is the difference in pressures, that is caused by the difference in water levels, that causes the ball to move. If you put an object with vertical walls, it would still move. The contact angles cannot change unless there is some chemical transformation, since it's defined by how much the molecules "stick" together.